Haha XD Gotta love Engrish. Hi Jana, thanks for taking the time to comment. Yes, when I spotted this bin, it was love at first sight. I stopped dead in my tracks and was like "Oh my God. I'm gonna photo this and put it up on the blog." Never knew a trash can could be so deep! lol. Haha...Kaori, that was a great pun. Big things happen in the simplest moments. Please reflect and adjust during your G.W. You should leave some food and burning incense to appease the wise trash bin..
Haha! Never thought Golden Week would become a time for such deep reflection. Best place to review your life is in the garbage. I saw some Engrish on a garbage truck today, actually. It said "The company that picks up your garbage" or something similar. I love finding these things around. 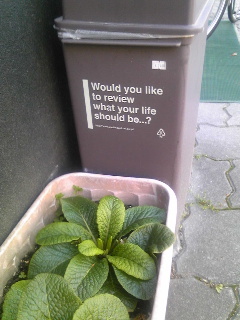 Great trash bin. Thanks, Jad Dee. It's funny because it's true. When you write your memoirs be sure to mention that this was the moment that changed your life forever.